U.S. President Donald Trump will suffocate Iran’s “dictatorial ayatollahs”, his close ally Rudy Giuliani said on Saturday, suggesting his move to re-impose sanctions was aimed squarely at regime change. 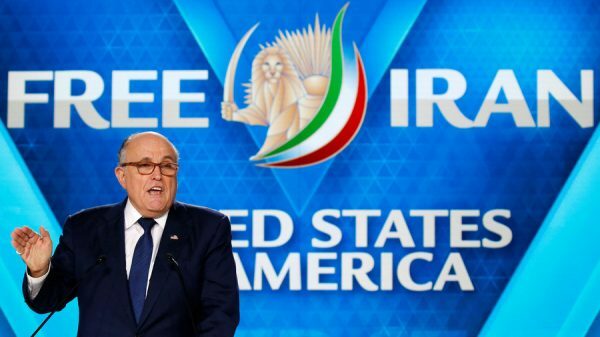 The former New York mayor who is now Trump’s personal lawyer, was addressing a conference of the Paris-based National Council of Resistance of Iran (NCRI), an umbrella bloc of opposition groups in exile that seek an end to Shi’ite Muslim clerical rule in Iran. “I can’t speak for the president, but it sure sounds like he doesn’t think there is much of a chance of a change in behavior unless there is a change in people and philosophy,” Giuliani told Reuters in an interview. “We are the strongest economy in the world … and if we cut you off then you collapse,” he said, pointing to protests in Iran. In May, Trump withdrew the United States from a 2015 international deal to curb Tehran’s nuclear program in exchange for lifting some sanctions. Trump supporters have spoken at NCRI events in the past, including national security adviser John Bolton, who, before taking his post at the same conference last July, told the group’s members they would be ruling Iran before 2019 and their goal should be regime change. Bolton said in May that the administration’s policy was to make sure Iran never got nuclear weapons and not regime change. In Tehran, supreme leader Ayatollah Ali Khamenei said Trump would fail in any attempt to turn the Iranian people against the ruling system. “They bring to bear economic pressure to separate the nation from the system … but six U.S. presidents before him (Trump) tried this and had to give up,” Khamenei said on his website. The fear of sanctions, which Giuliani said would be increased, has already seen major companies leave Iran despite Europe vowing to save the accord. Britain, France and Germany, which signed the Iran deal along with the United States, Russia and China say the agreement prevents Iran developing weapons-grade nuclear fuel. But Giuliani said Europe should be “ashamed” of itself. “Anybody who thinks the Ayatollahs are honest people is a fool. They are crooks and that’s what Europe is propping up … murderers and sponsors of terrorism. Instead of taking an opportunity to topple them they are now left propping them up,” Giuliani said. The NCRI members joined the 1979 Islamic revolution but later broke from the ruling clerics. Based in Iraq in the early 1980s, their fighters clashed with U.S. forces during the 2003 Iraq war, but have since renounced violence. “Regime change in Iran is within reach as never before … The wheels of change have started turning,” Maryam Rajavi, who heads the group, told reporters at the conference. NCRI, also known by its Farsi name Mujahideen-e-Khalq, was once listed as a terrorist organization by the United States and the European Union but is no longer. More fvcking Iranian terrorists caught again in bombing plot with explosive material. Belgian authorities said on Monday that the Iranian diplomat had been arrested along with a 38-year-old man and a 33-year-old woman, suspected of plotting a bomb attack on the meeting in Paris attended by US President Donald Trump’s lawyer, Rudy Giuliani, and several former European and Arab ministers. It is unfortunate that the Iranian opposition meeting was just ahead of Rouhani trip to beg the Europeans to support Khamenei’s terrorist regime and their terrorist attack just couldn’t wait. Their will be some pretty heavy denials coming out of Iran, but that is nothing new. Denial is the typical mind-game Iran plays. Plausible deniability and Iran uses this tactic all the time, except Iran does not have any credibility left and most expect terrorism from Iran as their Modus operandi. They are not fooling anyone anymore. Austria gives Iran 48 hours to lift immunity of diplomat implicated in bomb plot. Vienna deprives Iranians of their diplomatic status The day before the visit of Iranian President Hassan Rouhani to Vienna, there is a diplomatic scandal: Austria intends to deny diplomatic status to Iranian embassy official Assadollah A. (47) because he is involved in attacks against a gathering of exiled Iranians to be involved in Paris. As the Foreign Ministry announced on Tuesday, there is a European arrest warrant against him.